This package contains background information, digital leaflets as well as a complete, ready-to-use PowerPoint presentation about ship strikes! 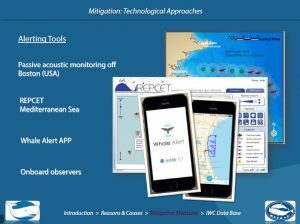 The PPT presentation was produced by the IWC (International Whaling Commission) in collaboration with M.E.E.R.. The presentation gives a short (approx. 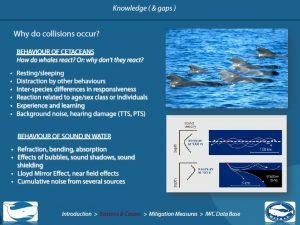 20 minutes) introduction to the issue of vessel-­whale collisions. It highlights the current knowledge as well as knowledge gaps and research needs. It sets out different levels of mitigation, including technical, legal/operational, and educational measures. 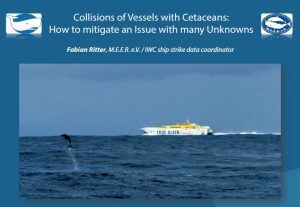 Finally, it describes the role of the IWC and its global ship strike database. The presentation is applicable in different contexts, e.g. to inform ship crews or representatives of other stakeholders, as well as the general public. It also can be presented at maritime schools and/or be incorporated into existing curricula. We would be grateful to know, in which context you are going to use this presentation. You can inform us HERE!